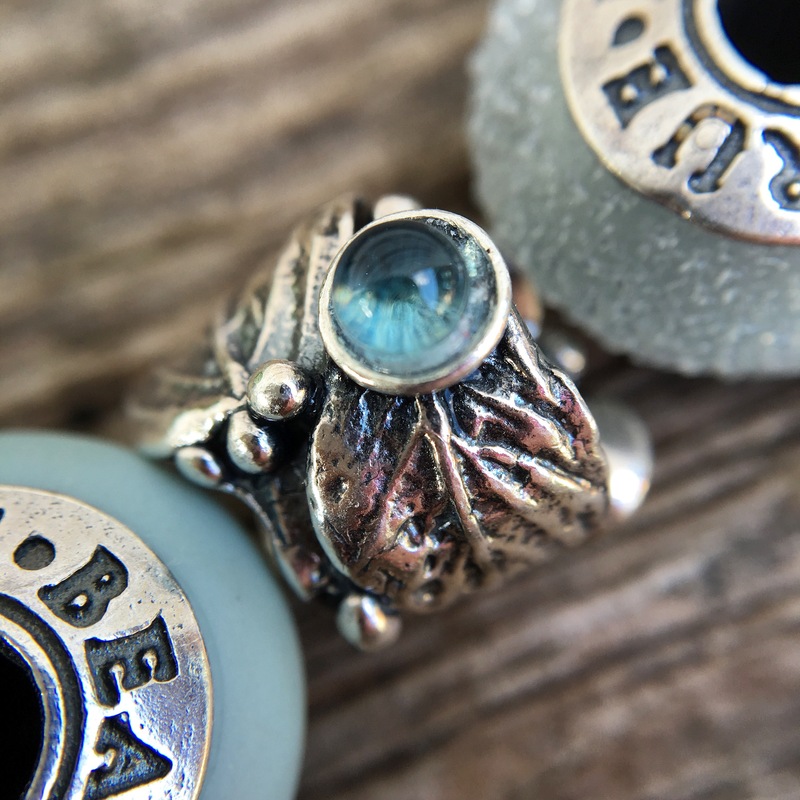 The Morning Dew and Youngberry beads from True Beadz are made of silver and glass. 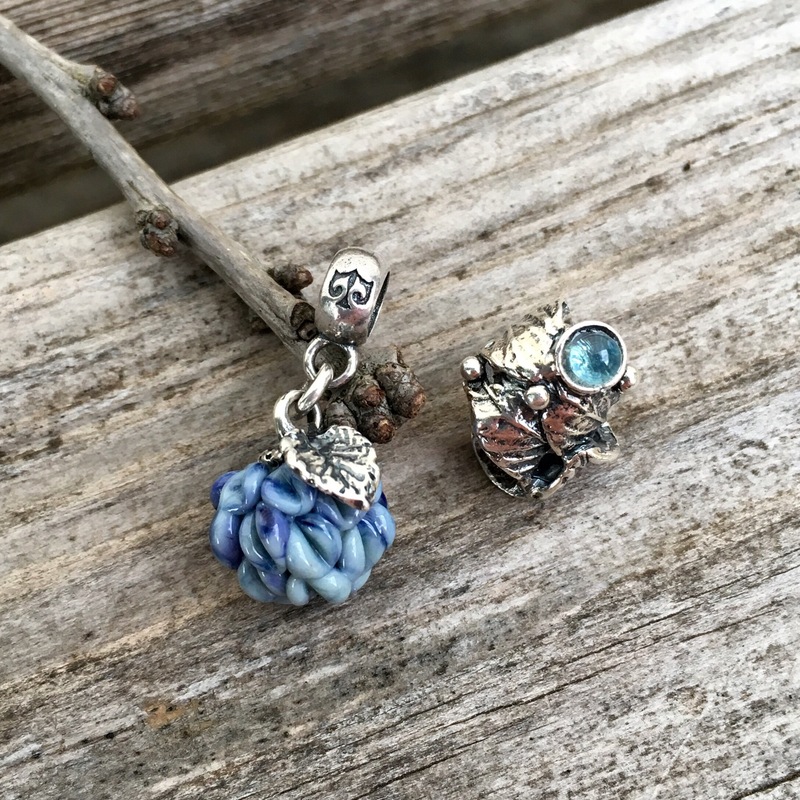 Youngberry is the dangle on the left and Morning Dew is on the right. Youngberry has a delightful silver leaf and is a really nice size. It could definitely be used on a necklace. But here I’m wearing it just with one other bead, a True Taste Blue Mist. I tried it between two glass beads and didn’t think it worked. I think it might also look good just all by itself! Morning Dew is a silver leaf, wrapped around, with two glass dew drops. The detail on this one is quite exquisite. 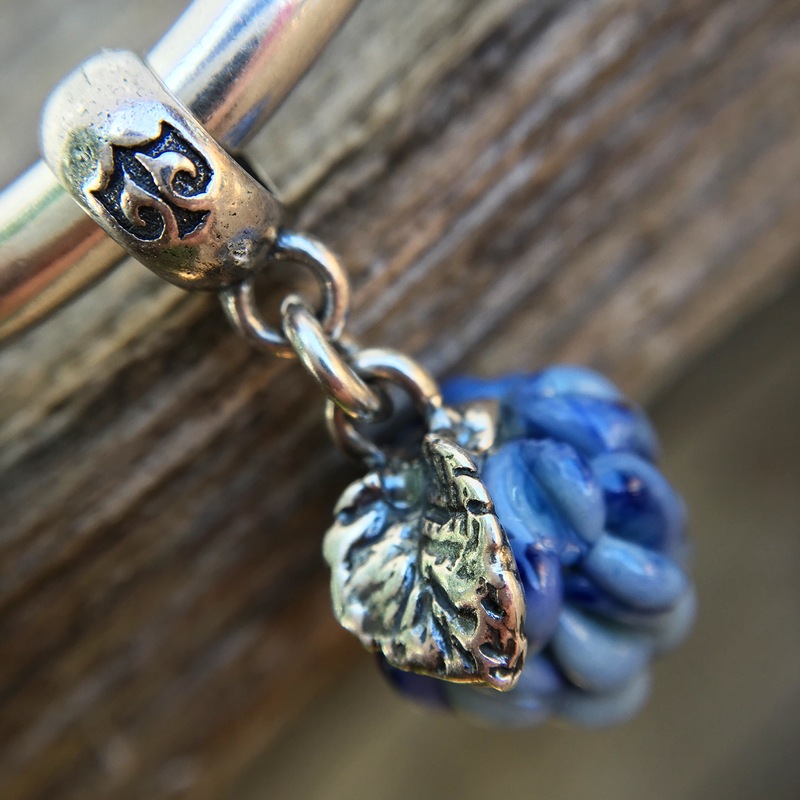 Here’s the Morning Dew on a chain bracelet so you can see the size. 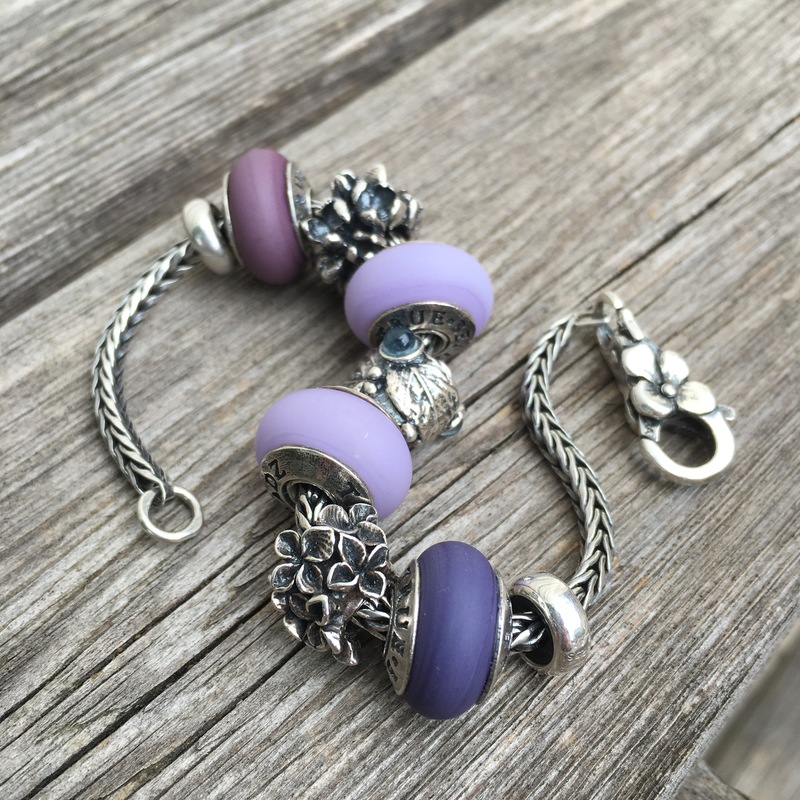 The other beads, top to bottom, are True Touch Purple Dream, Hyancinth, True Touch Lilac, Silver Lilac and True Touch Royal Viola. 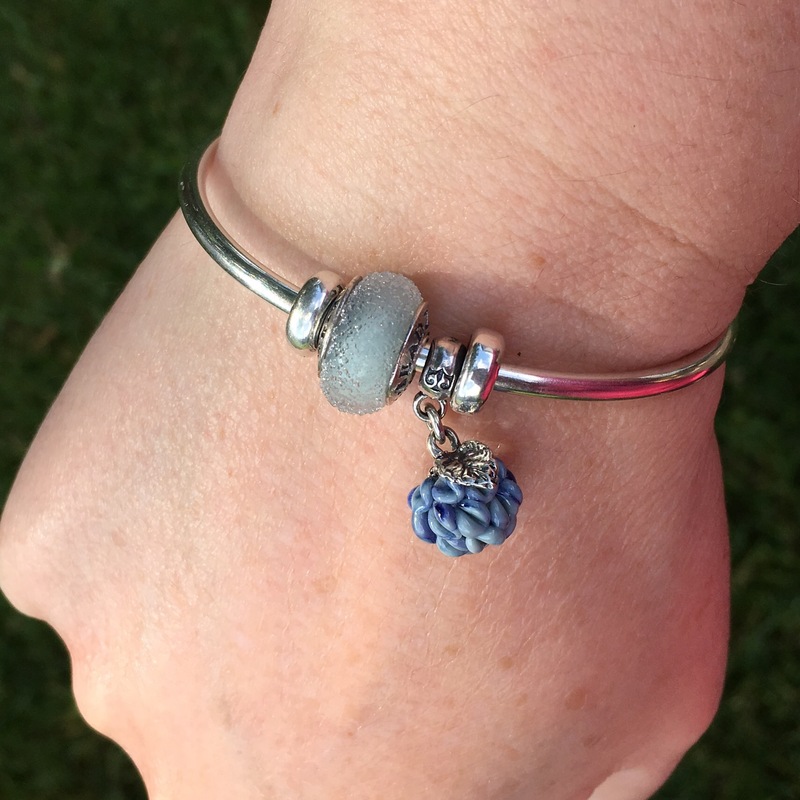 I’ve used it as a small focal point on a bangle with some beads from the Blue Mist colour group. It had just rained when I took these photos, but I don’t think you can see the rain drops, just the soggy flowers. Then, in one of those wacky weather days, the sun came out. Note how different the glass beads look in the full sun! 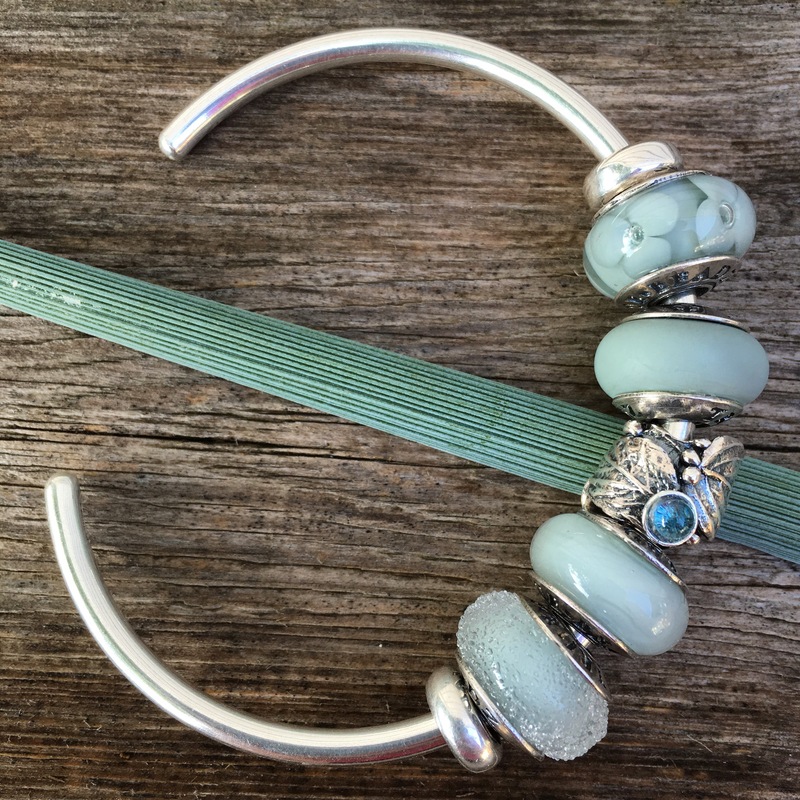 These beads will be lovely for fresh, spring bracelets and then for a pick me up in the dead of winter to help me forget about cold weather. 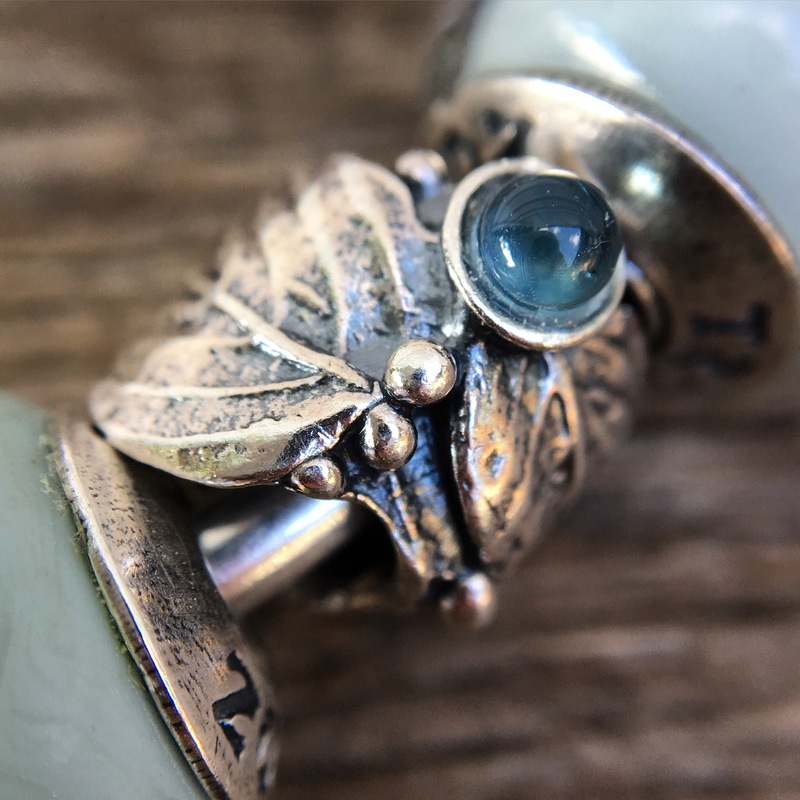 I Love the Morning Dew bead, I have seen it in IG posts but it didn’t look as pretty as it does in your photos and the same is true for the Youngberry. 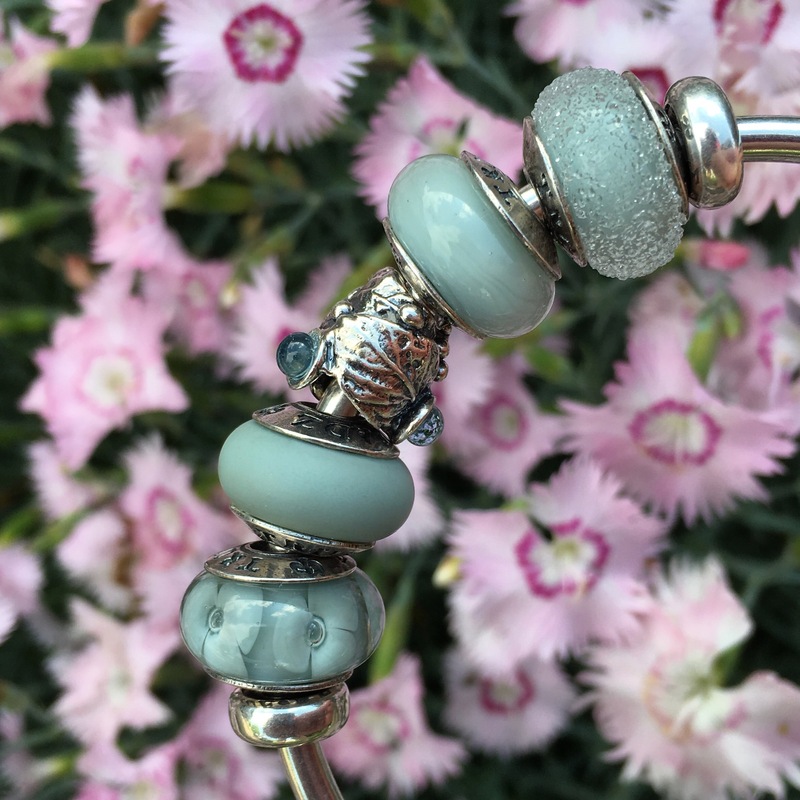 Both are lovely beads which I would dearly love to have for my collection! Sarah, won’t it be fun when we can see these in person in September? I’m going to have to try to not look at bead sales between now and then-I’m looking at you, Perlen. Lol! It’s really beautiful made. Yes, the never ending wish list. 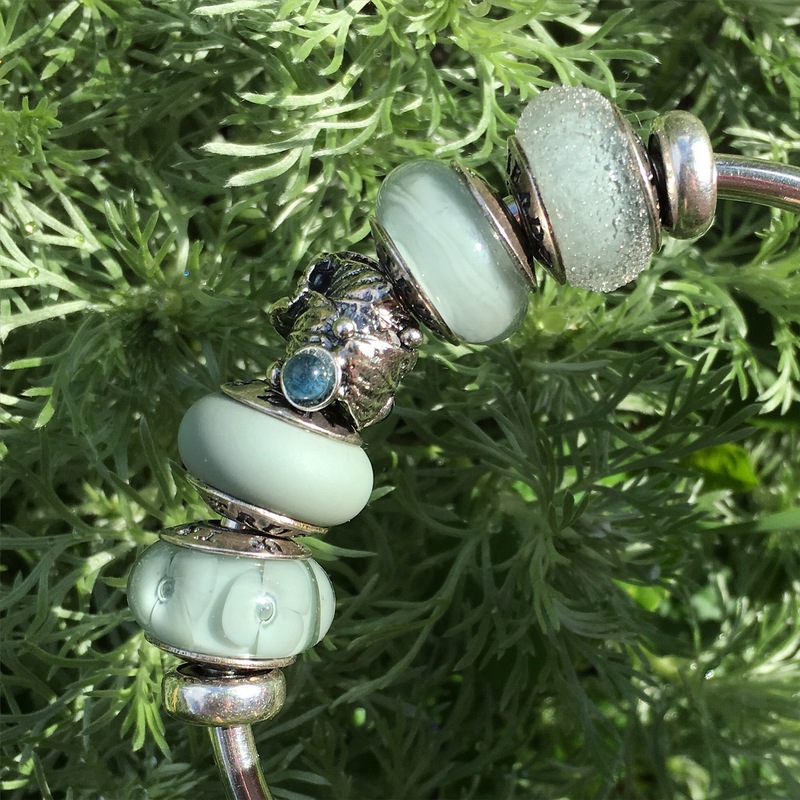 Did you buy something from the %20 off Trollbeads Perlen sale?